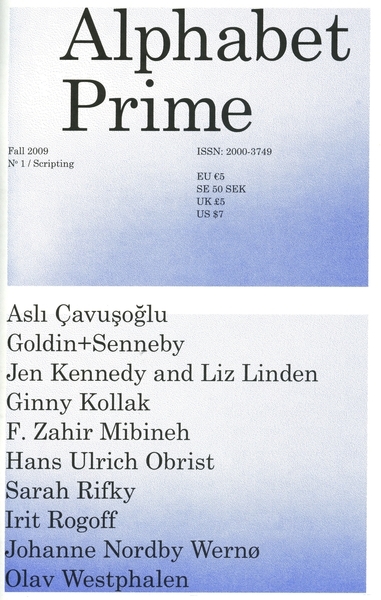 alphabet prime is a new biannual arts journal presenting critical texts, artist contributions, and fictional works, among other content. The publication takes as its focus the problem of language in contemporary discourse, and its limitations within the established framework of "theory." While the magazine is intended for artists, curators, critics and cultural scholars, it aims to further investigate the inherently interdisciplinary nature of the field of Fine Art, and may therefore incorporate polemic and expository texts from diverse professions and areas of study. 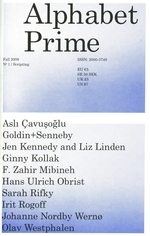 alphabet prime was initiated by Maia Gianakos, an independent writer, curator, and editor originally from New York and currently based in Berlin. The inaugural issue (released October 2, 2009 in Stockholm) represents the culmination of one year’s research and preparation done in conjunction with the CuratorLab program at Konstfack University College of Arts, Crafts & Design, Stockholm.